Yahoo! 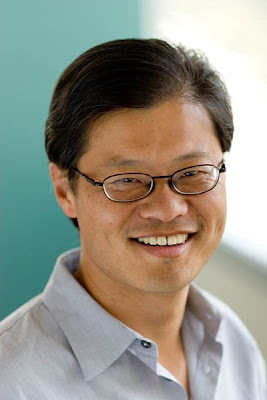 co-founder Jerry Yang answered to Congress’ House Committee on Foreign Affairs today regarding his company’s involvement with the Chinese imprisonment of Journalist Shi Tao. Shi had used his private Yahoo! email account to send a brief of a 2004 document circulated by the Chinese Government entitled: “A notice concerning the work for maintaining stability”–which warned of Pro-Democracy Chinese dissident activity–to The Asia Democracy Foundation. When asked for copies of the emails, Yahoo! handed them over immediately, as well as information about anonymous online postings by three other men that led to convictions for political crimes (all but one are still serving their time in jail). I don’t know about you guys, but it’s times like these that I’m glad I use Gmail. Jim Carrey, who we actually take kinda seriously, recently appeared in a PSA for a cause we take very seriously: supporting the world’s only imprisoned Nobel Peace Prize recipient, Aung San Suu Kyi. The spot also calls attention to Burma’s military regime, which recruits more child soldiers than any other country in the world, has destroyed 3,000 villages in eastern Burma, and forced 1.5 million refugees to flee. The star urges us towards two great organizations, The Human Rights Action Center and U.S. Campaign for Burma. All very good things. So why am I busy fighting awkward tingles and looking at Carrey’s hair? Four words of advice: MORE TEXT. LESS FACE. Sometimes well intended things go awry. Let’s just try harder next time!